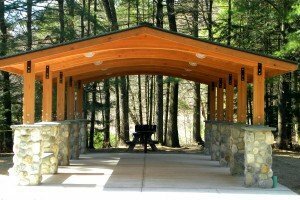 New York State Office of Parks, Recreation and Historic Preservation Commissioner Rose Harvey has announced the state added a 200-acre parcel to Moreau Lake State Park, expanding hiking opportunities in the Adirondack foothills and preserving open space in fast-growing Saratoga County. The Saratoga Automobile Museum’s Lost Speedways program which is scheduled for the Saturday after Thanksgiving (November 24, 2012), has grown into a must see event for those interested in the history of auto racing in New York State and long-shuttered area speedways. The program will also include Hall of Fame driver Brian Ross’ recollections of his short but eye opening Winston Cup career and his time as an instructor at Andy Hillenburg’s Charlotte driving school along with a look back at the highlights of the century old Fonda Speedway by longtime racing writer and DIRT legal advisor Andy Fusco. Memorabilia will be on display from 11:30 am, with everyone encouraged to bring items to display. The formal presentations will begin at 1 pm. &#8220With the cars of Dale Earnhardt and Curtis Turner and the amazing ’59 Thunderbird &#8216-zippertop’ scheduled to return to Charlotte October 1st, I’ll be replacing them with a Richie Evan’s Pinto and a gorgeous Speedway Division car wheeled by Wally Campbell, so the timing will be perfect. And we may have another surprise or two before November rolls around,&#8221 Hedgar said. There will also be a drawing of one winner in the auto museum’s NASCAR VIP Raffle, sponsored by M and M/Mars, which will see two winners each receive four tickets to the 2013 Sprint Cup race of their choice, $250 travel money, garage passes and a personal meet and greet session with Kyle Busch. The second drawing will be held in the spring of 2013. Tickets are $5 and may be purchased at the museum or online. The Lost Speedways event is free to museum members, with others admitted for the standard museum admission charge. 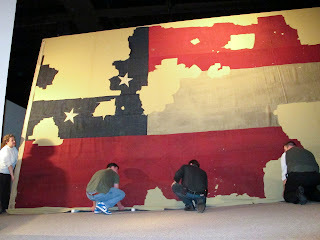 More information is available online at www.saratogaautomuseum.org. The Saratoga Automobile Museum is located on the Avenue of the Pines in the Saratoga Spa State Park, just off Exit 13N of the Adirondack Northway. 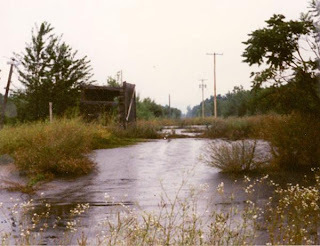 Photo: An abandoned South Glens Falls Drag Strip. 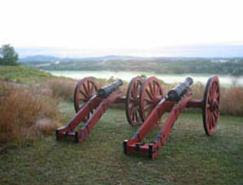 The Saratoga National Historical Park’s photo contest will held from now through October 31, 2012. The winning photo will be featured on the park’s 2013 Annual Pass and the photographer will receive a free 2013 Annual Pass. Once all photos have been submitted, the winning photo will be decided by a panel of Saratoga NHP employees by November 9. Next year marks the 75th anniversary of Saratoga National Historical Park (Saratoga Battlefield). 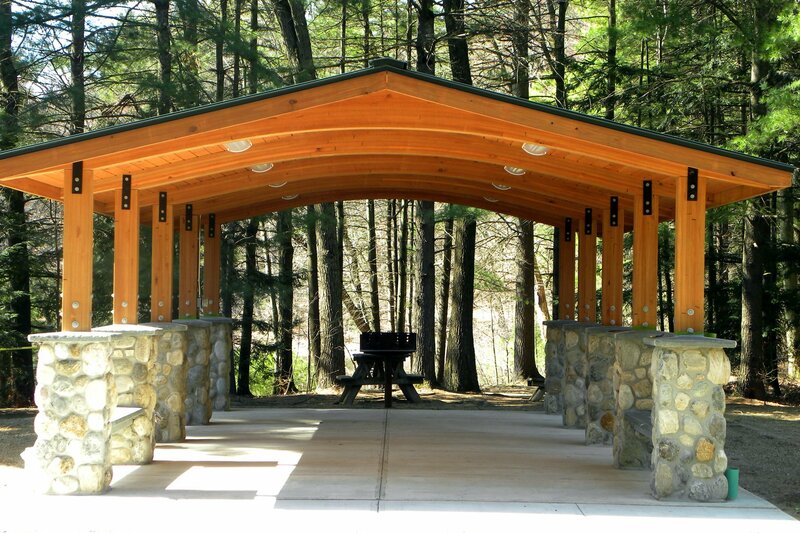 For more information about this contest or other park events, please call Megan Stevens at 518.670.2982 or visit: http://www.nps.gov/sara/parknews/newsreleases.htm. 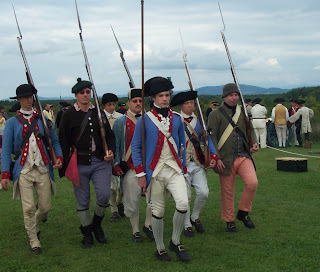 This Saturday and Sunday, September 15-16, Saratoga National Historical Park, located on Routes 32 and 4 in Stillwater, will present an 18th century living history encampment marking the 235th anniversary of the what’s been called the world’s “most important battle of the last 1,000 years.” Camps will be open Saturday from 11:00 AM to 4:00 PM, and on Sunday from 11:00 AM to 3:00 PM. This two-day encampment will surround visitors with the sights, smells, and sounds of military camp life from the American Revolution. Dozens of re-enactors portray American and British officers, soldiers, cavalry troops, and camp followers from the Battles of Saratoga. See cavalry charge, join in a court-martial and decide the soldier’s fate, take part in a musket drill, follow along with a scouting party, or listen to stories of the revolutionary war experience. Feel the thunderous roar of cannons, smell the acrid smoke of musket fire as well as the welcoming wisps of camp cooking fires. Local folk artist Richard Salls of Schuylerville has donated the original oil painting “225” to Saratoga National Park in Stillwater. “225” was originally unveiled in 2002 to commemorate the 225th anniversary year of the Battles of Saratoga and the 125th year of the Saratoga Monument. This work of art commemorates the surrender of British General John Burgoyne to American General Horatio Gates after the 1777 Battles of Saratoga &#8211 an event known as the Turning Point of America’s Revolutionary War. The village of Schuylerville, formerly Saratoga, is the site of the surrender. Salls, a long-time resident of Schuylerville, is no stranger to the rich history in the area. 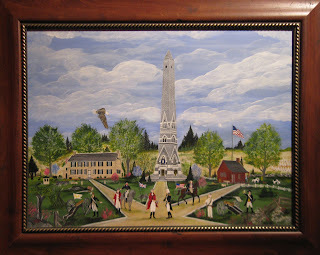 The painting features the historic sites of the Schuyler House, Saratoga Monument and Neilson House, very familiar places to Salls. The original painting will be on display at the park’s visitor center through September. Prints of the painting are available in the park’s gift store which features books, glassware, souvenirs, and other quality items about the Battles of Saratoga and the Revolutionary War. Further information about the artist is available at: www.saratogafolkart.com. For more information about this or upcoming events at Saratoga National Historical Park, the National Park in your backyard, call the Visitor Center at 518-664-9821 ext. 1777 or check the park website at www.nps.gov/sara or Facebook page at: www.facebook.com/saratoganhp. With favorable weather conditions in place, certified wildland firefighters at Saratoga National Historical Park, will undertake prescribed burning of approximately 40 acres of park land during the last two weeks of August. This “summer burn” will include the Chatfield Farm area of the Battlefield. The burns may take up to three days to complete, and the park will remain open to visitors during this time. The park has historically conducted prescribed burns in the Spring. This shift from spring to summer burning is an experimental approach to see if the application of fire at a different time will yield better results in the management of the types of plants found in the fields. It is hoped the summer burn will result in greater success in ridding the park of unwanted invasive and woody stemmed plants. need for personnel to work on hazardous slopes with mechanical equipment. Additionally, hazard fuel reduction around developed areas provides for firefighter safety and structure protection in the event of a natural wildfire. igniting a fire, and park staff runs down a go/no go checklist prior to any firing. If you have any questions about prescribed fires at Saratoga National Historical Park or park events, please contact the park’s visitor center at (518) 664-9821 ext. 1777. Ghostzapper (Awesome Again-Baby Zip, by Relaunch) won 9 of 11 career starts and earned $3,446,120. He was named Horse of the Year and Champion Older Male in 2004 when he posted a 4-for-4 record. Trained by Hall of Fame member Bobby Frankel, Ghostzapper won the 2004 Breeders’ Cup Classic in stakes-record time, covering the 1?-mile distance in 1:59.02. That year, he also won the Woodward Stakes, Tom Fool Handicap, and Iselin Handicap. At 3, Ghostzapper won the Vosburgh Stakes. 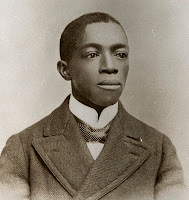 He closed out his career with a victory in the Metropolitan Handicap at age 5. Ghostzapper raced for Frank Stronach and is currently a stallion at Stronach’s Adena Springs in Kentucky. Foaled in Virginia at Maj. Thomas W. Doswell’s Bullfield Stable in 1855, Planet was sired by Revenue out of the Boston mare Nina.